Michael Schumacher showed that Ferrari was improving the F399 as he took pole position by 0.029s from Mika Hakkinen's McLaren-Mercedes. Eddie Irvine was third, underlining the improvement in Ferrari's performance. 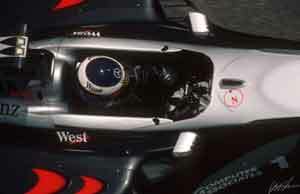 David Coulthard was fourth in the second McLaren with Rubens Barrichello's Stewart and Heinz-Harald Frentzen's Jordan being the usual supporting cast. Schumacher did not make a good start but a timely swerve across the track kept Hakkinen behind him in the rush down to the first corner. Further back the midfield was wiped out in the usual Montreal first corner smash: with Jarno Trulli spinning his Prost and cannoning into Barrichello and Jean Alesi's Sauber. Alexander Wurz's Benetton had to retire with suspension damage. After two periods of Safety Car - the second caused by Ricardo Zonta crashing his BAR into a wall - the race was on again. Soon afterwards, under pressure from Hakkinen, Schumacher made an mistake and hit the wall. With Schumacher out of the way Hakkinen had little trouble winning the race. Coulthard and Irvine collided during the pits stops but both rejoined and charged back. Irvine was up to fourth when second-placed Frentzen suffered a brake problem and crashed heavily. The race ended under a yellow flag, which prohibited overtaking, with Giancarlo Fisichella a rather surprised second in his Benetton and Irvine third.